The series of six volumes published by the University of Trento collects the writings of Martino Martini, in a critical edition, translated and annotated. It is completed by historical and iconographic Appendixes. directed by Federico Masini, (University of Rome, Sapienza). The series explores historical, geographic and scientific topics related to representations of the world, and the political, economic and cultural relations between East and West through the voyages of exploration and discovery that allowed direct relations between the two great civilizations. Edited by Martino Martini Centre in collaboration with Portolano Publishing & Communications. The series presents short texts, documentation and research materials on the work of Martino Martini and other important personalities who have contributed to the consolidation of relations between Europe and China. Books are in Italian, in English and Spanish. 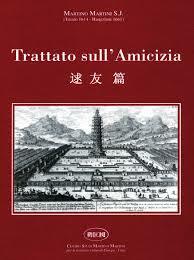 Edited by Martino Martini Centre in collaboration with the University of Trento. Six-monthly scientific- informative review investigating the common roots of European and Chinese civilizations, the evidences of trades and exchanges, and the reciprocal influences and interactions between them.